FILE - Police recruit Brett Johns looks at exhibits during an Oct. 1, 2015, program at the downtown library on the history of civil rights in Nashville. The police department is using the program as part of its diversity training. On the same downtown block where Nashville police officers carried a young John Lewis by his hands and feet to a paddy wagon for daring to take a seat at a whites-only lunch counter decades ago, today's fresh-faced police recruits are learning lessons about the fraught history between law enforcement and black Americans. About 60 police hopefuls, many around the same age Lewis was when he emerged as a leader of the civil rights movement, gathered recently in the “Civil Rights Room” at Nashville's main library. Dressed in plain blue uniforms, they listened to stories about Lewis and other college students who helped make Nashville the first Southern city to desegregate its lunch counters. Words Lewis uttered back then to urge his fellow students not to falter in the face of violence – “If not us, then who? If not now, then when?” – were inscribed on the wall above the recruits. As confrontations between police and the black community once again trigger public outcry, law enforcement leaders around the country are looking for new ways to restore trust. In Tennessee, they have turned to the Nashville library's rich archive on the movement to teach new recruits about past injustices, hoping the lessons of history will foster even-handed police work. The sessions with new recruits quickly became a core part of their training, and other law enforcement agencies around the country have taken notice. 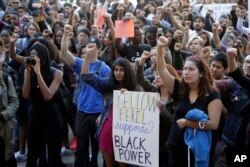 FILE - University California Los Angeles students stage a protest rally in a show of solidarity with protesters at the University of Missouri, in Los Angeles, Nov. 12, 2015. “This interaction is going to put in the minds of everybody in that room, ‘When I approach someone or someone approaches me, I need to think about where they may be coming from,’ “ said Nashville police Chief Steve Anderson after speaking to recruits at a recent session. For several years, the library's Civil Rights Room, lined with pictures of Nashville during the movement, has become the setting for regular programs about the role leaders like Lewis, Diane Nash, Bernard Lafayette and James Lawson played in the push for equal treatment. Some Nashville officers who visited the room while on a leadership tour were so impressed that they asked the library to develop a curriculum for new recruits, and later for veteran law enforcement officers, including members of the Tennessee Bureau of Investigation. At the library's first session with new recruits in April, instructors used images, films and oral histories to connect the past to situations they might face now. Nashville police recruit Micah Wright said the images convey the pain people feel when their rights are denied. “As long as civil rights aren't realized, then everyone is going to feel the burden and the pain from that,” he said. Andrea Blackman, who oversees the library's program, said police chiefs from across the country have visited the library to learn about the program, and some have asked her to put something together for their departments. Chuck Wexler, executive director of the Police Executive Research Forum, a Washington-based think tank, said new recruits can benefit. 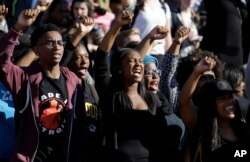 FILE - Students cheer while listening to members of the black student protest group Concerned Student 1950 on Nov. 9, 2015. That view is shared by some of the legendary civil rights leaders the young recruits are learning about. Bernard Lafayette recalled how during the lunch counter sit-ins, Nashville police would just stand by as he and other protesters were attacked. He said he hopes programs like the one at the library will help new recruits better understand their roles as protectors, and the trust bestowed on them.